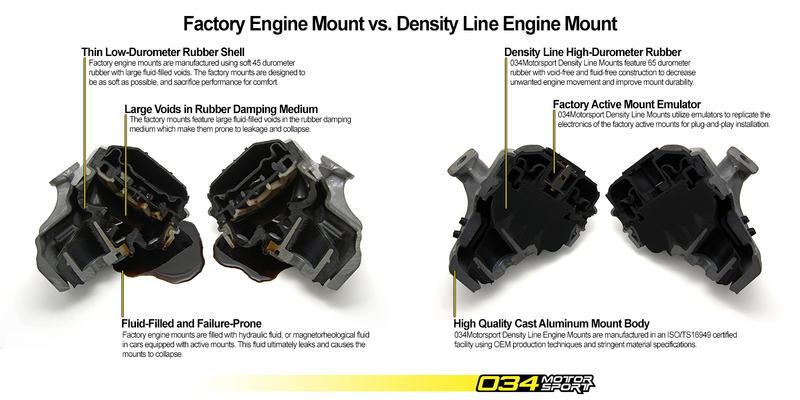 034Motorsport's Density Line Mounts are the new standard in comfort and performance. Our mounts are designed with performance in mind, and manufactured from high-durometer rubber for increased performance and durability, without sacrificing comfort. Density Line Mounts are void-free and fluid-free, eliminating the slop and the possibility of leakage and collapse associated with the factory mounts. The mount bodies are made from high quality cast aluminum using OEM production techniques and employ emulators to replicate the electronics of the factory engine mounts for plug-and-play installation. This ensures MIL-free operation for cars equipped with active engine mounts.